The Federation Towers, or Bashnya Federatsiya as they’re known in Russian, are part of the Moscow International Business Centre. And despite their different sizes, they fit their site perfectly. Both buildings mix residential and office space, and much more besides: car parks, shops and boutiques, apartments, a 5-star hotel, restaurants, even a viewing platform. And it’s the range of services and facilities that makes these magnificent buildings special: residents can find everything they need without leaving the complex. Construction of the towers began in 2005 and was completed in 2016. Both towers are built on an equilateral triangle floor plan, anchored to an enormous foundation slab and tapering as they rise. Fourteen thousand cubic metres of concrete have gone into the making of the towers: a new record. 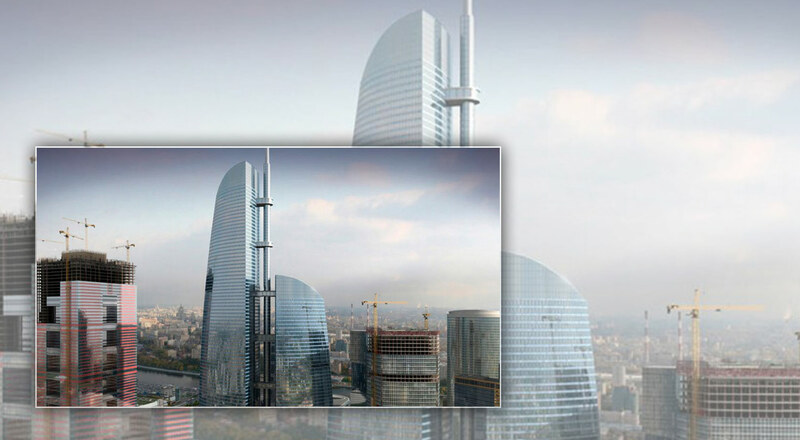 The architect in charge of both towers is Sergei Tchoban, working to designs by Mirax Construction. The higher, Vostok tower is 374 metres high, and with its antenna that takes it to 506 metres it is currently the highest building in Europe. The smaller component, the Zapad tower, was completed in 2008 and has 63 floors rising through 244 metres. It combines residential and service facilities, including some of the most important banks in the world. The façades of the towers are decorated with abstract cloud designs that create a sensation of weightlessness in the observer, and there are panoramic viewing platforms at various stages from ground to apex.